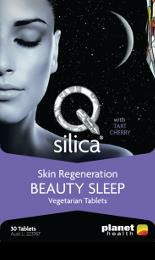 Qsilica Skin Regeneration BEAUTY SLEEP tablets are formulated to provide a dual action approach to ‘beauty sleep’ by supporting your body’s natural regenerative processes overnight. Nutrients and herbal extracts including Valerian, Hops, Chamomile and Magnesium may help to encourage a higher-quality, restorative sleep while Grape seed and Pine bark extracts offer cellular antioxidant support to assist the natural skin regeneration processes that occur during sleep. Colloidal silica promotes supple skin, healthy hair and strong nails. To encourage optimal results, use Qsilica Skin Regeneration BEAUTY SLEEP Night Cream as part of your relaxing night-time routine to nourish and hydrate your skin while you sleep. Adults: Take 2 tablets per day 60 minutes before bedtime. To encourage optimal results, use Qsilica Skin Regeneration BEAUTY SLEEP Night Cream as part of your relaxing night-time routine to nourish and hydrate your skin while you sleep. If symptoms persist, consult your healthcare professional. If you are pregnant or breastfeeding, consult your healthcare professional before taking this product. Store below 30°C. Store out of reach of children.